Did you know they grew like this? Neither did I - but thanks to Eat and Live Green, we know. Kids love to hate them. People in general seem to love to hate them, even. I think even as a child, the phrase "... not as bad as brussel sprouts!" must have passed through my lips at some point. If you look at them closely, though, they're actually sort of cute, like the cabbage's impish nephews and nieces. Although they can be quite bitter if not cooked properly, there are ways to enjoy them - which I only recently discovered. My friend Betsy introduced me to buttered sprouts in college, and later Robin showed off his culinary skills by sauteing them with olive oil and cumin. After buying some of these on a whim at Shaw's the other day, I decided to pair them with beets from the on-campus farmer's market and the flavors of cumin, salt, and pepper. Usually in my cooking endeavors, I don't really follow recipes faithfully. Actually, I typically stray, dip, mix, match, and come out with something that could either be great or a little dodgy (but I would eat it anyways). I guess that's the nature of creative cooking experimentation. I found 2 recipes that each used part of what I was interested in, but then fused them together for what I hoped would be a tasty result. Since I only purchased a small amount of both vegetables and estimated all amounts, I won't include a strict recipe but only a guideline of what I did... improvements welcome! The lighting makes the beets look scarily like red meat. Thankfully, it did not taste as such. In the end, the vegetables were a bit caramelized but could have benefited for a longer saute to make the sprouts more tender and a bit less bitter. Adding more cumin and maybe even a sauteed onion as suggested by the NYTimes recipe might have also sweetened them a bit, but the beets at least were quite delicious and made up for their slightly bitter companions. Boil the beets in a sauce pan for ~40 minutes while preheating the oven to 350 degrees F. When the beets have started to soften (can be slightly marked with a wooden spoon), fish them out and place them on a foil lined baking sheet. Roast for ~20-25 minutes (faster if you have a better oven than I do). Cool for 5-10 minutes, then peel and cube. Note: Sadly, beets take a long time to cook, but maybe someone has a better - meaning faster - method. I boiled first to speed up the process, but then finished off with roasting because roasted vegetables really just taste so much better with the flavor captured in the flesh rather than escaping into the water. Trim the stems off the brussel sprouts and boil for 7-10 minutes or until softened. Add a dash of salt to the water to flavor them a bit. Once done, slice them in half. 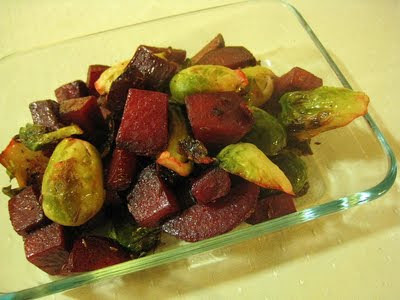 Heat olive oil in a pan over medium heat and add beets, sprouts, and spices. Be generous with the cumin! Cover it up and stir on occasion to avoid excessive burning, until sprouts fully tender and vegetables have begun caramelizing. Note: I did this for 5 minutes re: the recipe, but as I said above, I would have done it longer. Serve! I actually ate them alone since I had already eaten leftover pasta while I was awaiting the long process of beet cooking, but I could imagine combining this dish with couscous.